Like so many classic horror movies/books/comics, Slayaway Camp has finally breached the depths and entered… Hell. Ah, sorry, I mean… Hell Camp. Oh, and none other than everyone’s favorite, Skullface – in holy angelic form – will be laying waste to unsuspecting counsellors there! Groovy. Incredibly gory, but still very groovy. Why all these counsellors – or counsellors-in-training, I suppose – never learn is beyond me. Perhaps due to the fact that Skullface, alongside the many other killers added to slippery murder puzzler Slayaway Camp since launch, never leaves anyone to tell the tale. So how would anyone be able to warn everyone about the horror that awaits at various locations? How indeed, and it’s thanks to such violent perfectionism that Hell Camp exists, bringing murderous mayhem to, well, hell. Every time a bell rings an angel gets his wings and this time… the bell tolls for thee. Ah, almost forgot: console ports! 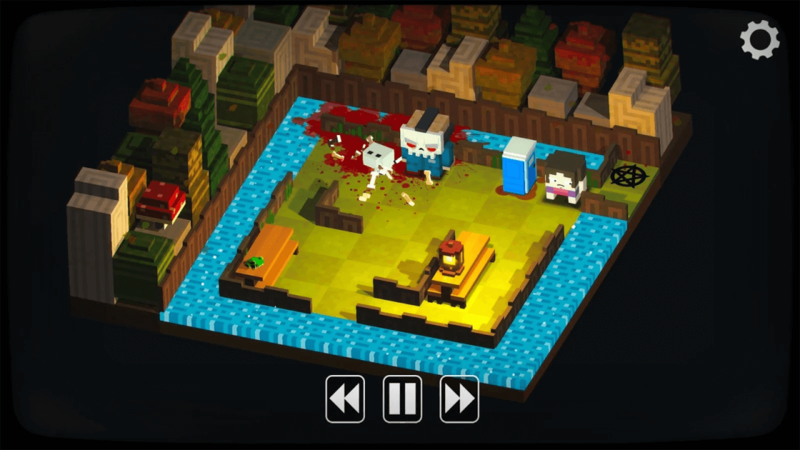 Slayaway Camp has been on PC and mobile for a while now, but about a week ago, the game finally arrived on both Xbox One and PlayStation 4 (as depicted by the lovely trailer below). Even better, the aptly titled Slayaway Camp: Butcher’s Cut is a bit of a ‘GOTY Edition’ releases, containing every piece of DLC (Deluxe Edition, My Gory Valentine, HellCamp, Monthly Murderers Series 1 & 2, Supernatural Forces, and Santa’s Slay). That’s more than 300 blood-soaked levels and over 60 different killers, each with their own unique… methods. Muahahaha. Slayaway Camp is available from/for Steam, Humble Store, Google Play, iTunes, PlayStation 4, Xbox One.